Diti Ronen: “I suddenly have this unexplained urge to send you for publication these two poems along with three images—out of hundreds—that were made by Isis Olivier, the granddaughter of Sir Laurence Olivier. 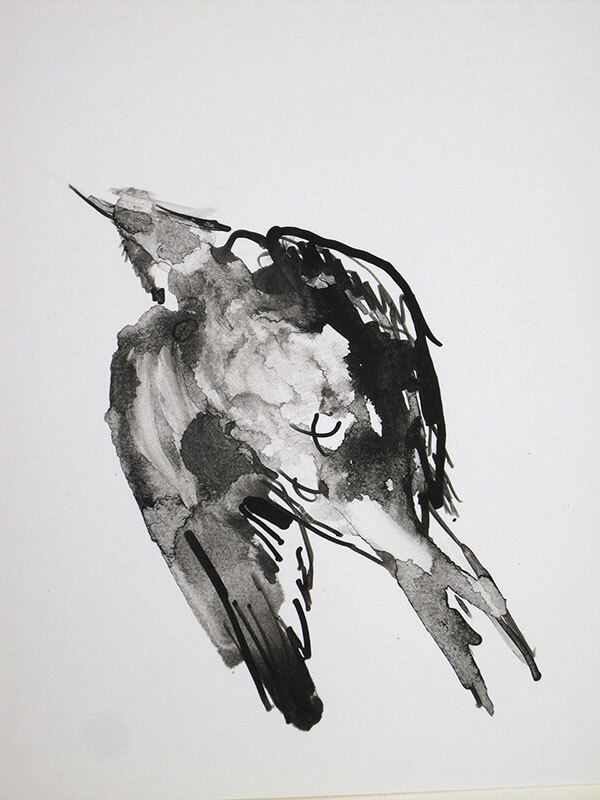 Isis, an accomplished French artist, read my poem ‘littlebird’ in 2014, when it was presented in French at the Lodève Poetry Festival, France. 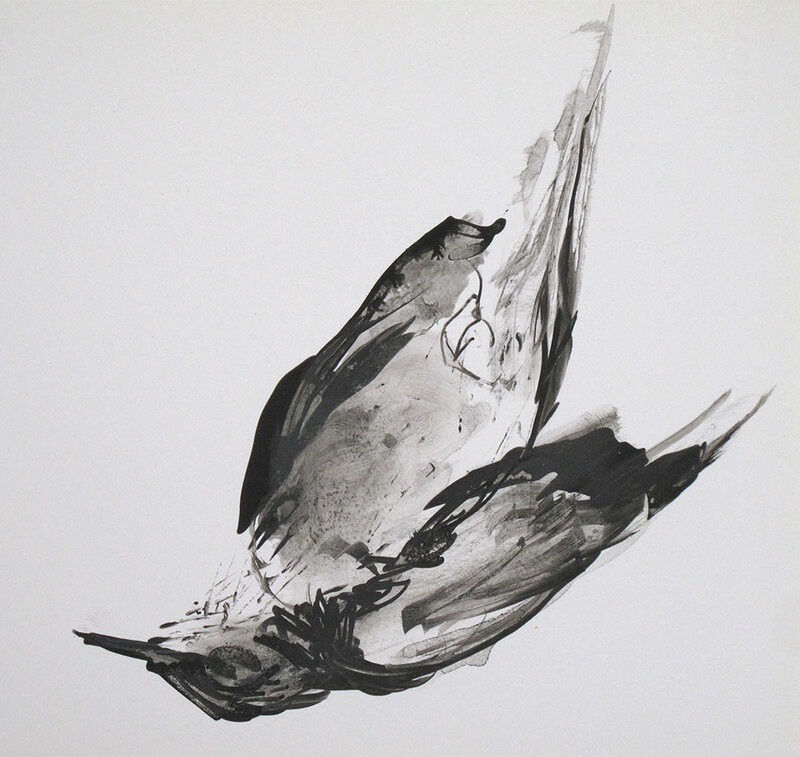 Ever since, along with other projects, she continues to draw the moment of the falling of the bird, and we have already presented together four exhibitions, including readings. 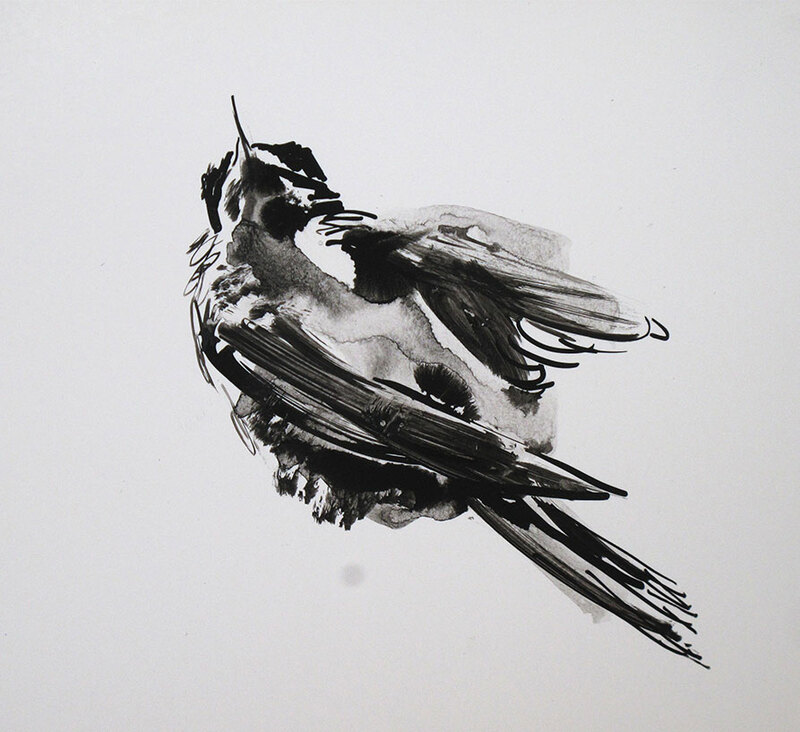 Surprisingly, the act of drawing the endless moment of the falling, inspired by the poem, is actually done with the help of dead birds that she finds on her way or at her doorstep, unexpectedly. The poem ‘Fifth Bird’ was written recently, right after she told me about a new bird that came to die at her doorstep” (email to Daniel Simon, August 24, 2016). To die at your feet. Again you delve into the body of the poem. From Above and from Earth. Look, she is taking off. the entire sky is in front of her. who does not see the detail. There was, surely there was. There, another bird, taking off. Do you still see on it any wisp of smoke? you cannot see a thing. and the sun is in mid sky. Did the sun indeed shine? And what was the shape of the cloud? God, watching, did He notice the bird? leaning on it, ever so trustingly. It too is quiet. Slightly moved by the wind. humming the sounds of its origins. Have you noticed the nest? Have you seen the nestling? With the tree next to it. It descends here, to sit on a bough. No. Begin with her tree. No. Begin with the tree next to her tree. Can you see the forest clearing? There are lager barracks there. Begin with the tenth barrack. Look, a handsome woman now leaves it. color and sound of before. gliding, her wings spread open. his hat hanging in sloppy elegance. Have you seen his uniform? The emblems on his sleeve? The officer holds the rifle in his hands. He stands by the barrack. The rifle in his hand. Draw him tall. And very straight. what shall he shoot now? The bird now stands on a branch. Draw him looking, draw the look. He moves, turning to the woman. forgets his mark. His muscles relax. Draw the gun descending, slipping down his arms. Draw the firing position fading. He looks at the woman. dressed in a sack and a simple waistband. her gaze fixed on the bird. Draw him looking at the woman. the ripples sent forth from her behind. There, she has entered the latrine. He once again lifts his weapon. indifferent to the train of her behind. Could you draw her sinking? and back. Was she hurt? Draw her leaving the latrine. She walks. There, she walks, she is unhurt. Stands up and fixes the sack on her body. She sends a wary look. to arrive inside, to return. No, begin again with the officer. His gaze returns to the woman. He still looks at her. lifts the bird from the ground. She’s twitching, her body still warm. now he hands the bird to the woman. Now, please draw the woman. a little bird in her hand. they are not hurt. Now they are all inside. They worried about her, what was that shot? Now they are all inside. And a little bird, dead. Now they are all inside. And a little bird held in her hand. Begin with the woman’s friend. No. Begin with the Blockalteste. Hides her daughter in a little cabin. She is good. Begin with the baking oven. No. Begin with the bird. Who plucked the feathers out? Why should the feathers be plucked? And what does the Blockalteste have to do with the bird? Please draw for me a little bird. No. Please draw for me a little pot. No. Please draw for me a little oven. And inside the belly of the pot is a bird. That you don’t have to draw. Begin, begin with the woman’s friend. No, begin with the woman. her eyes grow accustomed to the darkness. She looks at her friends, holds the bird. No. Begin with the woman’s friend. she’s older. No, not that old. She’s still young, just a little more mature. and walks over to the Blockalteste. and hinting to the little oven. Elevates, and hints to the little pot. Elevates, slowly, and hints to the margarine. Lightly tilts her head to the right. Elevates, pauses, and hints to the flour. She has patience. For pepper and for salt. Look. Now they are huddling in sweet secrecy. Draw the hope. The hunger. No. Begin with the woman. begin already. Come on, begin. Begin with the, the, with the quiet. Begin with the silence. The silences. Just be silent and don’t begin. Don’t write and don’t draw a thing. Forget all that you’ve said. And be silent. Erase all that you’ve written. And be silent. Erase and forget. Forget and erase. And let go of the barrack. Let go of the officer, let go of the woman. Let go of the hunger, let go of the gaze, let go of hope. Leave the silences, leave the voices. And don’t think oven, or pot. And don’t touch story, or song. Forget. Erase. And don’t speak. And if you must, begin at least with noiseless. In your head, in a whisper. Whispering. Begin with the longing. The yearning. Do you know what bechinalt is? Of course you do. making the senses lose their mind. Draw the little apartment in Givatayim. and a light breeze comes in from the sea. Begin with mother, in the afternoon. explaining to me about flour, and how to make roux. Draw her tall, by the stove. Draw her pretty, on high heels. With the taste of much, so much, so very much time. 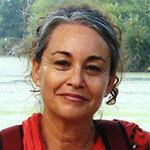 Diti Ronen is an Israeli poet and editor. She has published six full-length collections of poetry as well as numerous essays and articles. 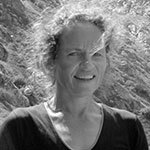 Her poetry has been translated and received international and national awards and published in literary magazines and anthologies worldwide, including the November issue of WLT. Elazar Tal Ronen is a prolific musician, lyricist, and songwriter. A graduate with honors of CCNY in 2009, Ronen is a prominent member of the New York jazz scene. As a songwriter and lyricist, he’s collaborated on internationally praised albums. Isis Olivier (https://isisolivier.com), the granddaughter of Sir Laurence Olivier, is a painter of English origin. She lives and works in the Cévennes, a mountain region in southern France. Some of her paintings and prints have been published in France, the UK, and, more recently, the United States and Israel. Editorial note: “littlebird” was first published in 2010 by the Sal Van-Gelder Institute for Holocaust Instruction and Research at Bar Ilan University, Israel, in a Hebrew/English bilingual edition, including an introduction by Hanna Yaoz and an interview with the poet. The booklet was printed in a limited special edition for researchers and students. The poem has been translated into many languages, including Arabic, Hindi, Albanian, French, Polish, Romanian, German, and Swedish. פוסט זה פורסם בקטגוריה חדשות ואירועים News and Events, ספרי שירה Poetry books, ציפורקטן (פואמה), הוצאת אוניברסיטת בר אילן 2010, מהדורה דו לשונית (עברית ואנגלית) כולל הקדמה וראיון עם המשוררת, שירה Poetry, עם התגים Fifth bird, Isis Olivier, llittlebird, Poetry, איזיס אוליבייה, אמנות, ציפור חמישית, ציפורים נושרות, ציפורקטן. אפשר להגיע ישירות לפוסט זה עם קישור ישיר.